Okay, so this is nothing new. 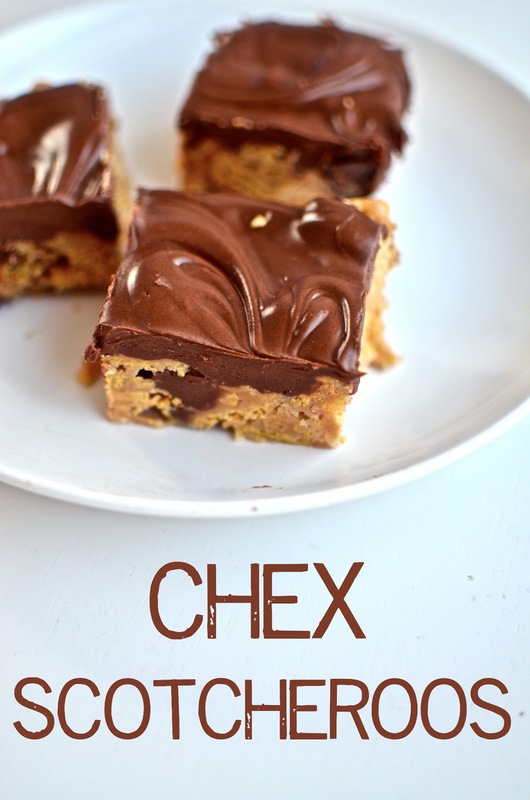 I already posted K-bars on the other blog and these are pretty much the exact same thing only with Chex instead of Special K.
I know, I know, you were hoping that for once maybe I would post something "healthy", but come on. What's the fun in that? Grease a large round bowl and pour the cereal in. Set aside. Grease a 9x13 inch pan. Set aside. In a pan on the stove, combine the corn syrup and sugar. Stir over medium high heat until it comes to a boil. Immediately remove from heat and stir in 1 1/2 cups of peanut butter. Immediately pour this mixture over the cereal and fold in. Pour into the 9x13 pan. I love cereal treats! Simple, yet classic. You could use the chocolate chex if you wanted more chocolate! These look awesome! Hershey's butterscotch chips are GF. absolutely delicious! just can't wait to try it out. Is there a way to make this peanut free as well?? I made them today and substituted Sun Butter (nut-free sunflower seed butter) for the peanut butter, and they were great! A little more expensive, but as a celiac with nut allergies, such is life. Thanks for the info re: Sun Butter! Most amazing recipe ever. This is my go to for when I have to bring something to a potluck or party. I've had so many requests for the recipe and I direct them here! I made your Chex Scotcheroos tonight to bring to a dinner party. They were so easy to make and beyond delicious. Everyone loved them. I will absolutely make these incredible treats again. I used Sunbutter to make them nut free, too. Such a great flavor and I love the chocolate/butterscotch crunch. Yum! These look great. I have a friend coming over this weekend that has Celiac, so I am excited to make them! I am a little confused, though. The ingredients list says 1/2 cup peanut butter, but the directions say 1.5 cups. Am I reading it wrong? Aha! Apparently I missed that! :-) Thank you! So I tried the chocolate topping in the microwave and on a double boiler. It turn pasty set up. What did I do wron. try melting just the chocolate and butterscotch chips. I would suggest 4 minutes at half power, then stirring, and microwaving another minute if necessary. Be aware that butterscotch chips (as well as white chocolate chips) contain a wax-like ingredient to hold their shape which can make them resistant to melting. Sometimes I just give up and leave the butterscotch chips partially melted - it will still taste great. Anyway - stir in the PB and vanilla after the chips are melted (or as melted as they will get). You may have boiled the corn syrup and sugar too long I make a similar recipe with Rice Krispies which calls for boiling these two ingredients for 1 minute. When I have accidentally boiled it longer, they have turned out hard. Frankly, you don't even need the sugar. We feel it makes the cookie cloyingly sweet. I just follow the directions, omitting the sugar. Other than being less sweet, they turn out just the same. Good luck on your next batch. Great to know about omitting the sugar, seemed like it would be very sweet! I can't have corn syrup. Has anyone tried making these with honey or maple syrup? I just made these with agave nectar vs corn syrup and it cooked up and tasted just fine. How many servings (roughly) does this make? I've been thru 2 bags of butterscotch chips. Silly question, but what do you grease with? I usually use Pam spray, but butter or any cooking oil also work great. Shared with my readers and pointed them here for directions. Thanks for the recipe!